Localized convection in Barbados accounts for hazardous conditions and a significant percentage of the island’s annual rainfall. The feature results in rainfall accumulations exceeding 50 mm in 3 hours or less, over isolated locations. Weather Research and Forecasting model (WRF) simulations are conducted for a rapid convective initiated and heavy precipitation event of 26 August 2008 over Barbados. The simulation results from the 1 km grid resolution domain depict that the shallow topography on the island plays a significant role in enhancing convective activity under weak synoptically disturbed conditions. The model results also demonstrate that the driving forces for the development of deep convective clouds include low-level moisture convergence that form as a result of the temperature differential between the land and the ocean and forced low-level uplift as a result of the blocking by the topography. The high-resolution WRF simulations demonstrate its capability to accurately capture the low-level flow over the island, as well as the orientation of the divergence and convergence patterns throughout the depth of the atmosphere. 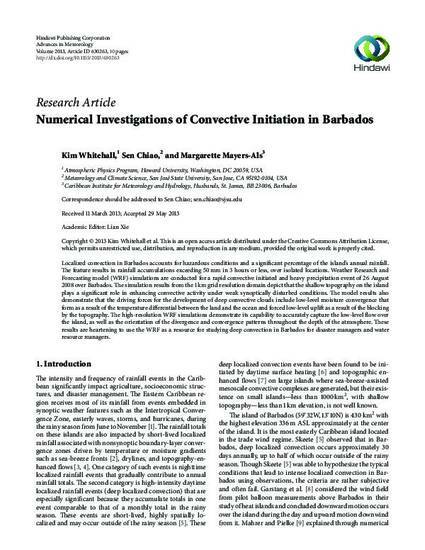 These results are heartening to use the WRF as a resource for studying deep convection in Barbados for disaster managers and water resource managers. This article was published in Advances in Meteorology, volume 2013, and can also be found online at this link. Copyright © 2013 Kim Whitehall et al. This is an open access article distributed under the Creative Commons Attribution License, which permits unrestricted use, distribution, and reproduction in any medium, provided the original work is properly cited.